An article in The Times in March last year appears to have excited little interest, even though the subject was of some concern to most of us. "Climate-change damage may double cost of insurance," the headline screamed, with the strap declaring: "Weather-related problems have been underestimated by scientists." These were the supposed findings of the Association of British Insurers (ABI) reflecting "a growing belief in the industry that the consequences of changes in weather patterns have been underestimated," but they were not alone in their dire predictions. Also mentioned was a forthcoming (at that time) report from an agency called the International Institute for Applied Systems Analysis (IIASA), based near Vienna in Austria. This was to forecast that there were financial implications for governments as well, showing that the EU Solidarity Fund, which is worth €1 billion and is supposed to cover "uninsurable risk" for government-owned infrastructure such as roads and bridges, is not enough to cover the damage caused by the more frequent storms and flooding that are expected. The study, incidentally, was funded by the EU Commission. But this was by no means the only foray into climate change for the IIASA, which has a very active climate change programme, being one of the leading research institutes on global environmental change. And one particular researcher, Dr Anthony Patt, was lead author on a report, "Estimating least-developed countries’ vulnerability to climate-related extreme events over the next 50 years," and it is fair to say that a constant theme emerging is the need for public money to support those who suffer from climate-related catastrophes. Such themes are also of very great interest to Dr R K Pachauri and his pet institute, TERI, and it may come as no surprise that he and Dr Patt are often seen sharing the same platform or, at the very least, singing from the same hymn sheet. But references to Patt are very often seen alongside another Pachauri – not Rajendra but Shonali Pachauri, who seems to share his concerns about climate change. This, though, should be unsurprising. 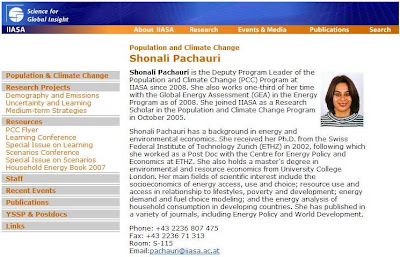 Dr Shonali Pachauri is the deputy programme leader of the population and climate change (PCC) programme at the IIASA, and has been since 2008, having joined IIASA as a research scholar in October 2005. Incidentally, she also works one-third of her time with the Global Energy Assessment (GEA) in the energy programme, as of 2008. Given that they are covering the same territory, it is also unsurprising that the GEA and representatives from Dr R K Pachauri's TERI often share the same platform, and there is obviously some degree of liaison between the two operations. In fact, the "liaison" might be closer than the public record indicates as there is a certain relationship between Drs R K Pachauri and S Pachauri. Shonali is, in fact, Rjaendra's youngest (of two) daughter. Shonali is undoubtedly well qualified for her current posts, She has a background in energy and environmental economics and received her PhD from the Swiss Federal Institute of Technology Zurich (ETHZ) in 2002. She also holds a master's degree in environmental and resource economics from University College London. However, it can do RK Pachauri no harm at all having his well-qualified daughter in such an important and prestigious post, working in the same field. One is almost tempted to call the old firm, "Pachauri & daughter", so closely allied are they in the climate change industry. As for the elder daughter, she is Rashmi Pachauri – and often calls herself Rashmi Pachauri-Rajan. She, like her mother, Dr Saroj Pachauri, works on population issues, the latter being regional director, South and East Asia Regional Office, Population Council, working out of New Delhi. Mother and daughter have at times worked together. Until relatively recently, Rashmi seems to have been based in New Delhi – and may well have been there while a visiting scientist, a certain Andy Reisinger, was based there, helping her father on the IPCC synthesis report. Reisinger, however, moved back to New Zealand were it seems, for not obvious reason, Rashmi Pachauri currently lives (spool down - pg 135). Is there a connection? We could not possibly say, but with Andy currently on paternity leave, it would be interesting to know the name of the mother of his recently-born child. New Zealand is a small country and someone must have that little bit of information. It certainly would be interesting to learn whether Dr R K Pachauri's family connections are even wider than we thought.